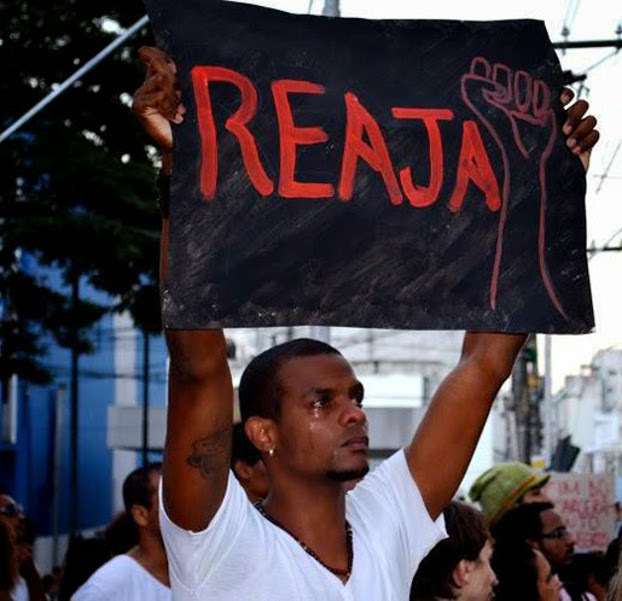 On February 6, 2015, the police of the Brazilian state of Bahia executed twelve Black boys and men with gunshots to the neck in the Vila Moises area of the Cabula neighborhood in the city of Salvador. There were signs of torture, such as broken arms and sunken eyes, violent treatment that could have equally been the work of the police of São Paulo, Alagoas, Rio de Janeiro, or Pernambuco. These are law enforcement practices disseminated throughout the country. The youngest victim was fifteen years old. The oldest was twenty-seven. A massacre isn’t simply an isolated anomaly, and it shouldn’t be seen as such. Massacres practiced by the police forces of Brazilian states exemplify a complete failure of public safety policy and of our republican values, as well as a human rights violation. Rather than the deaths themselves, the novelty of this massacre was the ensuing public discourse of the recently elected governor of Bahia, Rui Costa, who defended the killings. The police chief went further on the morning after the massacre, inspired by the never ending police chronicles, deeming the massacre a successful police operation that killed preventatively. The chief of police defined the massacre as a goal of the police snipers who, rather than police alongside a community and meet its individual needs, decide to eliminate targets in seconds from a calculated distance. This illustrates the ways in which the police trivialize and disrespect the lives of people who pay taxes and the salaries of a police force that kills when it should be protecting them. Terrified witnesses in Cabula stated that the twelve boys and men were unarmed, there were no signs of confrontation, and they were rounded up and beaten before being taken to a field surrounded by bushes and executed. Since the governor belongs to the left-wing party, there were those declaring nostalgia for the truculent times of Antônio Carlos Magalhães, the three-time governor of the state of Bahia, in what amounted to a cruel joke, as bad as those likening Governor Rui Costa with the retired Portuguese soccer player with whom he shares the same name. Further fanning the flames, the governor responded ironically to a question posed at a February 6th press conference about the possible scare that the violence perpetuated by the operation could cause to tourists from São Paulo, habitual visitors to Bahia’s carnival. In an attempt to be witty, he attacked the public safety record of the southern state by implying that São Paulo tourists are accustomed to violence since São Paulo has the highest rate of bank robberies in Brazil. Since it is known that the police executioners alleged that the twelve massacred boys and men were going to assault banks, it wouldn’t be frivolous to infer from the context that the twelve Black Bahians were killed (preemptively) to protect White São Paulo tourists. It is also widely known that White tourists from São Paulo flood Bahia’s carnival annually in search of the famed ‘exoticism’ of the Black Bahian woman. The racist intertextuality of government discourse is as macabre as the application of the death penalty for young Black males. The Secretary of Public Safety of São Paulo, Alexandre de Morães, did not hesitate to respond. He in turn called the governor of Bahia “feeble and ignorant,” in an exchange of informalities reminiscent of comic book dialogue. He revealed that the crime rate of Bahia is four times worse than that of São Paulo, and concluded that the statements of the northeastern representative disrespected the affection that Paulistas have for Bahians and the importance of tourism to Bahia. Done—the geopolitical supremacy of São Paulo ended the conversation! Even the response, logically, of the modern football captain is no match for the Robocop captain of the metropolis that looks down upon Brazilian Northeasterners, revealing the country’s regional fractures. And where are the twelve dead boys and men in this discussion? They disappeared in the volatile and folksy speech of the murderers who justify their act as a fight against crime. And what about the families of the victims? No one listens to, supports, or compensates them. They are victims of the deadly artillery deployed in a dreadful game that’s been bought in advance, in which the loser is already declared before the referee’s coin toss. An isolated voice has a name, last name and an address; a lady, or a young brother or victim’s cousin who might be the next victim. The grandfather of one of the deceased, Natanael de Jesus Costa (age 17), screamed at the entrance to the hospital that his grandson simply went to deliver pizza to his girlfriend’s house, which was next to the field that later served as the stage on the night of the crime. The boy disappeared from home, only to reappear on the list of bodies to be recognized in the coroner’s office. And what do the bulk of the population in poor and indigent neighborhoods do now? They repeat, like parrots, the discourse of the legitimization of death heard in the sensationalist bandit-hunting television programs. They believe that if they align with the strongest contingent, the owners of weapons, they will receive protection because they are the workers and the others are the outlaws. What a farce! No one – no one – is a citizen when there is impunity! And the taste of the victims’ blood will only reach the mouths and the eyes of the supporters of the massacre when the gunshots destroy the lives of the children raised by their families and their community—the people who have seen them grow and bring pizzas to their girlfriends, or who were overcome by substance abuse, or by overt pressure as well as the allure of drug trafficking. It’s always our dear boys who become dead bodies littering ground. None of these twelve ‘preemptive’ deaths is justified, even if one of them had a criminal record. And they are certainly not a testament to the success of a police operation. An operation that purposefully results in twelve deaths is arbitrary and illegal. It is catastrophic. Policing should preserve life, not eliminate it to then be excused by explanatory technicalities. The survival of young Black men throughout Brazil is at stake in the face of a racist construction of the preferred suspect. This is already inadmissible. More reckless still, is that the governor publicly legitimizes and defends the massacre as a kind of winning shot, all the while immortalizing police shootings in poor and unprotected neighborhoods that cannot, and should not, be transformed into gladiator stadiums, where the police practice shooting young, Black male targets in accordance with the wishes of the governor. In Brazil, the head of the state police force is chosen from within the ranks of the police force by the governor. In this case, the current governor of the state of Bahia, Rui Costa, is also the head of the state police force of Bahia. Secretário de São Paulo diz que declarações de Rui são “débeis” e ignorantes (Secretary of Public Safety of São Paulo says that Rui’s statements are “feeble” and ignorant) http://www.bocaonews.com.br/noticias/principal/politica/106100,secretaria-de-sao-paulo-diz-que-declaracoes-de-rui-sao-debeis-e-ignorantes.html accessed February 23, 2015. Brazilians residing within the state of São Paulo. Cidinha da Silva: Cidinha da Silva is a writer, essayist and dramaturge. She has eight published books and edited an anthology published in 2014 year titled Africanidades e relações raciais: insumos para políticas públicas na área do livro, leitura, literatura e bibliotecas no Brasil (Africanisms and race relations: inputs for public policy in the area of books, reading, literature and libraries in Brazil). Cidinha is a doctoral candidate in the Multi-institutional and Multidisciplinary program in the Diffusion of Knowledge at the Federal University of Bahia. Cidinha blogs at http://cidinhadasilva.blogspot.com.br/.